Financial advisers are missing out on a huge market. Women comprise 51% of the population, hold $22 trillion in wealth--yet they’re largely ignored, which makes them a woefully underserved market. When your firm fails to engage female clients, you miss out on a significant amount of business. An intelligent assessment of your agency’s marketing message, client communication and service approach can provide you with the perspective you need to correct course, and connect with this largely untapped pool of potential customers. Ask most financial advisers, and they say, “Our products and services are for everyone.” Their marketing materials say otherwise. These pieces largely are geared toward a male audience, crafted for a linear approach (because that’s how the male mind travels). That’s not necessarily how a woman’s mind works. Reaching, engaging and earning the female dollar for your practice requires a more thoughtful approach. When your firm fails to engage female clients, you miss out on a significant amount of business. How are we guiding them? I recently went through a divorce, and the women in my support group got to talking about finances. They largely felt at sea in terms of money, saying things like, “I’m not sure I can afford it,” “I don’t know what my household income was,” “I didn’t handle the money,”—there’s a huge disconnect. These women, all educated and intelligent, still had scads of questions about their cash flow and finances, and they weren’t getting answers from financial advisers. Insurance and financial organizations win the award for Least Sympathetic Industries for Women. When women peruse marketing messages, they don’t see themselves there. They feel their needs aren’t met, their concerns aren’t taken seriously, and they feel devalued and dismissed. This gap leaves most women unprepared for their financial future. Here’s where you can step up. Purse Strings offers a program to educate and empower advisers to connect with this largely untapped market. We collaborate with you to pinpoint what you’re doing wrong, share examples from who’s doing it right, and show how you can reach, engage and earn women’s dollars. 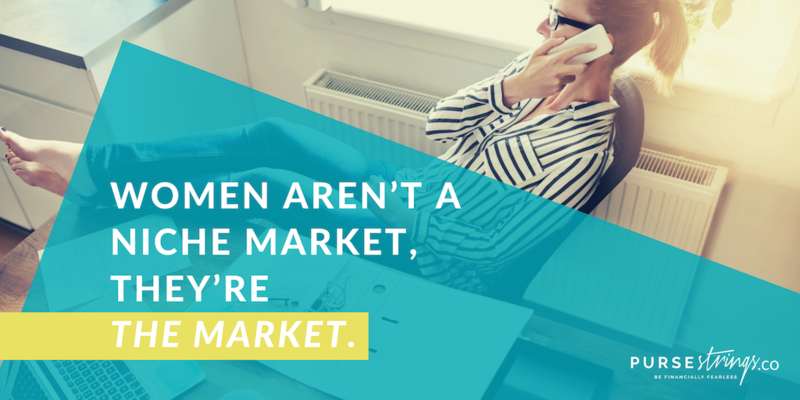 Women aren’t a niche market, they are the market. Realizing and working toward that can open up your agency to huge opportunities and empower women to be financially stronger. Contact Purse Strings to find out how you can tap into it.